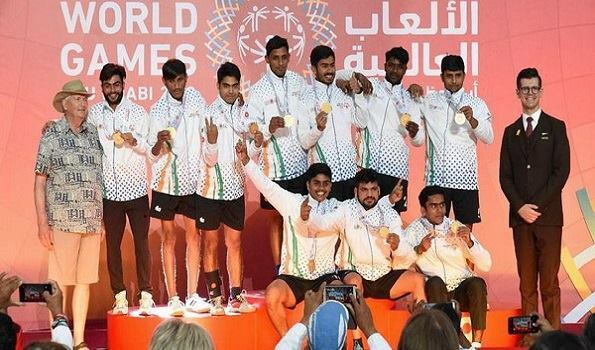 New Delhi: Delhi Cantonment-based Army Public School has bagged four gold medals in the recently concluded 15th Special Olympics World Summer Games which was held from March 14 to 21 in Abu Dhabi, United Arab Emirates (UAE). Talking to UNI, the school's Principal Neetu Kapoor said, "It's a matter of immense pride that our students have won four gold medals at Abu Dhabi World Summer Olympic Games. We have bagged two gold in cycling and one each in handball and badminton. A total of five differently-abled students from this school were selected for the games.For Football Gaurav Sharma, Anil Kumar and Durgesh Mall were selected while for Badminton--Vikrant and Sakshi for cycling. Cyclist Sakshi bagged two gold medals in the two-km and four-km road race, the principal informed.Shuttler Vikrant won gold medal in the doubles category, while Yogesh bagged the top honour in the Unified Handball game. On imparting skills and training, the principal said, "Sakshi was provided with latest equip special bicycle while modern infrastructure and special physical training helped in tapping and channelizing the potential in the right direction and enable her emerge as a winner." "Other participants including Vikrant and Yogesh, were given professional physical training and special coaching for the game," she added. The training and skills were being provided under the leadership of chairman Brig Sameer Lanba, the Principal said.A 'strong contingent' of 378 Indian athletes, coaches and staff had participated in the Special Olympics (SO) event in Abu Dhabi. This was the first time that the SO were held in the Middle East and the North Africa (MENA) region since the Games started over 50 years ago.It was India's ninth participation at the SO World Summer Games. The SO Bharat contingent including 289 Athletes and 73 Coaches along with 16 officials and Assistant Staff from all over India participated in 14 out of 24 Olympic-type sports featuring the mega event. Special Olympics is the world's largest humanitarian sporting event and a global movement which focuses on the empowerment of People of Determination with intellectual disabilities through the power of sport.